Takeaway: Working in a confined space requires a lot of planning. Start with these seven considerations. Confined spaces are found in nearly every industry. And due to their nature, it’s imperative that workers entering them exercise a high degree of caution and take extra steps to ensure their safety. According to OSHA, approximately 1.6 million workers enter confined spaces annually. 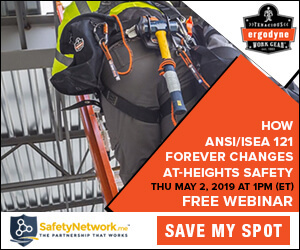 They also estimate that if employers fully comply with safety standards, 53 worker deaths, 5,000 lost-day cases, and 5,700 other accidents can be avoided every year. Unfortunately, most confined space injuries and fatalities are due to employers and workers failing to recognize, plan, and control for the hazards related to this type of work. A NIOSH review of confined space fatalities found that in each case there was a lack of recognition and testing, evaluation, monitoring, or well-planned rescue (learn more about Emergency Preparedness and Response Plans). Identifying an area as a confined space is the first step to taking proper safety measures. Confined spaces are not necessarily designed for people, but are large enough for workers to fit inside. Unfortunately, many people who work in confined spaces don't recognize them as such and, therefore, enter without taking the necessary precautions. OSHA defines a confined space as having the following attributes. A wide variety of spaces can be considered confined, including manholes, tanks, sumps, silos, storage bins, tunnels, and pipelines (find out How to Keep Agricultural Workers Safe from Common Grain Bin Hazards). There are a number of key things to review before entering a confined space, and we’ve compiled the top seven. They're listed in no particular order, but they're all highly important. While it may seem obvious that a worker has to enter and exit the space, doing so isn't always as easy as it seems. It’s important to devise an entry and exit plan for confined spaces. Confined spaces can be difficult to maneuver – even just fitting into these spaces can be a challenge in and of itself. So, workers need to have a clear understanding of how they will get in safely and get out once the work is done. Before anyone enters a confined space, the atmosphere must be tested using equipment designed to detect chemicals and gases that may be present. The tests should be conducted at levels well below the defined exposure limits. A technically qualified professional must carry out the testing and make decisions about next steps. The space should be tested regularly to ensure atmospheric conditions remain safe. If workers exit a space and later need to re-enter, the atmosphere needs to be tested again. Continuous monitoring of the space is ideal. Confined spaces don’t usually include overhead lighting for worker convenience, and moving around in dark spaces can increase the risk of slips, trips, falls, and other accidents. Workers can't avoid these kinds of hazards if they can't see them, so make sure they're equipped with light sources that are specifically approved for confined space environments. Damaged equipment may not operate effectively and could put workers at risk. Health and safety professionals recommend inspecting equipment regularly to make sure it's in good shape. Keeping workers safe is the top priority here, so make an honest assessment of what kind of shape the equipment's in, even if it means having to delay the work or buy a replacement. Part of maintaining equipment means storing it properly. Equipment that gets thrown around can be compromised, sometimes without showing any obvious signs of damage. Storing all confined space equipment in a single trailer, which can then be hooked up to a truck and towed to the site, is a great way to ensure equipment is well cared for and continues to function as it should. Is the space at height? Is it underground? Are the walls sloped or is there overhead material that could collapse? These are questions that you need to address prior to letting anyone entering the confined space. Will the workers face a risk of engulfment, entrapment, flooding, or fall from height? If so, they need to have the right PPE and be briefed on dealing with the specific hazards. Studies show approximately 40 percent of confined space fatalities involve rescuers. So, it’s safe to say that having a well thought out rescue plan is critical. Rescue procedures should be established before entry and should be specific to the type of space involved. All personnel should be trained on emergency procedures and a written plan should be in place. All employees should be aware of potential hazards and untrained workers should never attempt a rescue. Practice makes perfect. Rehearse the rescue procedures frequently to ensure rescuers are proficient enough to eliminate life-threatening rescue attempts. Rescuers who are comfortable with their duties also tend to be calmer and more efficient when responding to an emergency. While many prefer wireless systems, they can result in connectivity and reception problems when there is no line of sight. Hard-line intercom systems offer some of the best communication for confined space operations. They are full duplex and use wires to interconnect headsets and components, forming an intercom system between up to 10 workers. Initial and operating costs are low and non-line-of-sight communication is guaranteed, making this a strong option for keeping workers safe (for advice on using communication equipment, see Radio Etiquette for Safe and Effective Communication). Given the risks associated with work in confined spaces, it’s imperative that employers take training seriously. Far too many companies emphasize increasing performance and productivity to simply get the work done, failing to adequately train their workers on proper procedures, hazards, and precautions. Workers who receive sufficient training are more likely to identify and control for confined space hazards and to get the job done safely.